In our previous post on the Cambridge English Scale, we looked at the scale in general. In this article, we will look in more detail at the Cambridge English Scale and how it reports results for the FCE exam. In addition, students will also receive a score in Use of English. Using the Cambridge English Scale, the scores should give students (and teachers) a clear understanding of the students’ performance. The five scores are averaged to give an overall result for the exam. In addition, the students will also be given a grade as well as their CEFR level. The FCE exam is targeted at Level B2 of the CEFR, which equates to 160 to 179 on the Cambridge English Scale. However, the FCE exam also provides reliable assessment at Level C1, which is above B2. 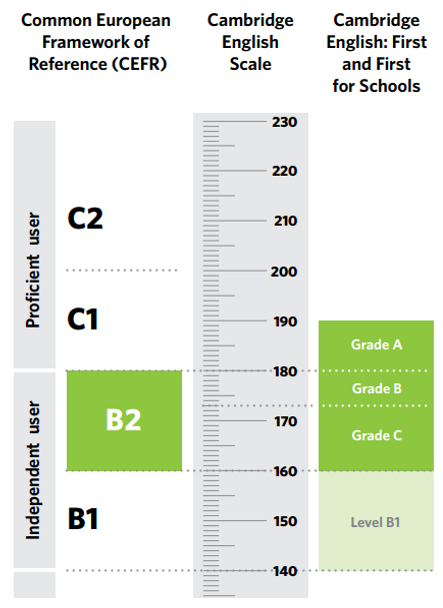 It also provides assessment at Level B1, which is the next level down from B2. To receive a certificate for Cambridge English: First (FCE), students must receive a score between 160 to 179. Students who receive a score between 140 and 159, receive a Level B1 certificate to recognise their achievement. Students who receive a scores between 122 and 139 are also reported for Cambridge English: First (FCE). However, they will not receive a certificate, but their Cambridge English Scale score will be shown on their Statement of Results.